Canton Port Services maintains a real time web-based cargo tracking system which we developed to allow our customers to “see” their cargoes, check inventories, and monitor inbound or outbound deliveries. Each cargo transaction is immediately entered into the system from each terminal site. We capture the driver’s identification and even his digital signature at the point of transaction using RFID technology. We developed this tracking system shortly after the company was formed to provide a secure way to account for each bundle of metals for our approved Foreign Trade Zone warehouse. 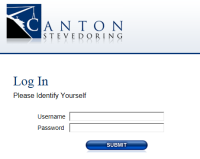 A client signs in using a secure ID and password, and views inventory by the vessel/voyage, arrival dates or by the customer’s reference number. Warehouse inventory is sorted by unit, bill of lading, or lot number. The benefit to our customers is their ability track their assets from any location at any time. In order to provide one customer with accurate, timely information, Canton designed and implemented Bar Coding technology to capture the movement of export vehicles in the gate and on the ship. We use hand held computer scanners to capture and verify each unit as it is received and again as it is loaded on the vessel. This Bar Coding service is an example of how Canton Port Services caters to the customers’ needs. Trucks delivering or picking up bulk cargo are weighed on the Weigh-Tronix Bridge Scales inbound and outbound. The cargo weight is immediately available to that cargo owner. Contact us today to find out how we can use technology to provide you with secure access to real-time inventories.